This week, we’re excited to announce that we’ve released an improved app version with some amazing new features. 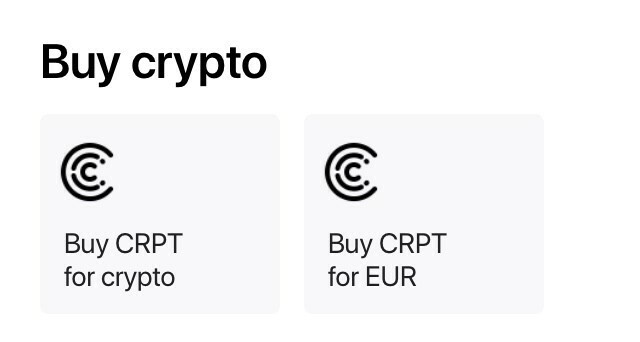 From now on, you can buy CRPT tokens with Bitcoin or fiat money in the app in just a few clicks! We’ve also added the News Section to keep you informed of the latest industry updates. If you’ve been to our app lately, you might have noticed a new button. Yeah, that one on the upper left saying “CRPT”. Click on it and discover the easiest way to buy the tokens. Going to an exchange is not necessary any more. Using our app you can now purchase CRPT directly from your account with either fiat or Bitcoin. Say, you want to pay with fiat money. Enter the amount of CRPT you wish to buy then, get your invoice with the transaction details and wait for the status of your operation to change from “pending” to “invoice paid”. That’s it! Want to buy CRPT with BTC? You’ll be surprised with just how little effort the purchasing process requires. Enter the amount of CRPT and tap the “buy” button. Yep, there are only two simple steps. In the nearest future, you’ll also be to buy CRPT with other cryptocurrencies, not only BTC. Keep a lookout for our updates. Would you like to know what’s trending in the market? What’s being discussed among crypto community members? Just sit back with a cup of coffee, Crypterium is here to digest some of the top crypto news for you. In our news section you can find market analysis, in-depth article as well as updates on the Crypterium app. P.S. make sure you have the latest application version installed so you’ve always got our latest and greatest improvements.